I cannot believe it; I have blinked and Christmas 2011 is here! Phew, what a year…can I just recap? Went to Dubai and worked with George Calombaris, as my alter ego Candy Liscious the failed beauty queen. Thermomix in Australia launched the Asian cookbook, which I had been working on for a long time. Went to Melbourne and spent a couple of days with the amazing Dani Valent on the In the Mix shoot. Then went to Germany and Switzerland as part of the International Jury for a beautiful new Vorwerk Cookbook, out soon. Completed the recipes and photo shoot for the Thermomix in Australia 2012 Calendar available now. My number four child went to the States to study. I LEFT THERMOMIX in Australia! (Phew, thats a biggie, so deserved capitals!) July 4th, need I remind you, Independance Day, was my last day at head office and if you thought I was busy thus far, can I just mention…things then went into overdrive. Created a Dinner Spinner, a small book consisting of 21 recipes that you can create yourself in a Thermomix, which in one week, sold 700 copies …and many more to go yet! I also got all jiggy and wrote, and styled a cookbook called For Food’s Sake which has 160 pages, full colour pictures for every recipe (80 of those) and is so gorgeous, that I can scarcely stand the excitement. It will be available on here really soon, as well as in good bookstores and also online at Hub and Spoke or at my cooking classes! Speaking of which; I started running my own advanced cooking classes using Thermomix. These have been held in Melbourne, Sydney, Newcastle, Perth and Mandurah to sell out crowds of amazing lovely people. It has been my pleasure to meet some fantastic people who are truly as passionate about the Thermomix and making great food as I am. Started importing a chocolate product called Crio Bru to Australia which is the most amazing healthy yummy product around and if I can put it into food or recipes, I will...but perhaps you know that already? I totally love it, and so do thousands of other happy customers. We will be in retail outlets just as soon as I can take a minute to help my very valuable marketing guru business partner more than I am at the moment! Started working for Kleenmaid in Australia, and am truly impressed by their new range of products which are about to get installed into my kitchen Monday. We have already had some successful sales as a result of my running classes in their amazing Sydney showroom, so thank you for that, and for believing that I would not get involved with anything that was less than excellent! I have happily welcomed Heilala vanilla, Margaret River Chocolate Factory, Fini Olive Oil, Lighthouse Flour, and fantastic branding from Braincells to the Cooking with Tenina team. The other team Tenina members that I have to mention are Hub and Spoke publishing and Scott Print. I just love getting the phone calls from Hub and Spoke and mentioning casually in conversation, 'just talking to my publisher’ or ‘please hold for a second, my publisher is calling’…you get the idea…still makes me smile/downright grin! And last but not least, the guy that got all this web stuff started for me, made me join Twitter when it was still something that only birds did, and now screens my calls because there is always something new I need him to add, remove, fix from any and all of my sites, the very patient, Luke Holder, nephew, son, dad, inspirational Tech guru! Sorry to put you through all that, but hey, what a year no? I am looking forward to a great 2012 but before we can get there, we have the little matter of Christmas to attend to…so to the job at hand. A little sneaky one from this year. Pistachio Marzipan, which I have to say has 100’s of applications and may just start showing up in all sorts of recipes from here on in…If you do not like marzipan, do yourself a favour and give this a go…it is not like any marzipan you have ever tasted. 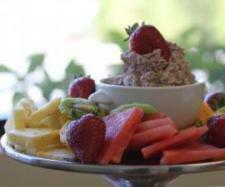 Toblerone Dip…The fruit at Christmas in Australia is fantastic, so joosh it up a bit with this one. Simple enough to whip up in no time, and impressive enough to make your guests come back for more. How about a little tradition? I make this every year and this year I have made it and tweaked it, so essentially, this is a new recipe! Aren’t you lucky? 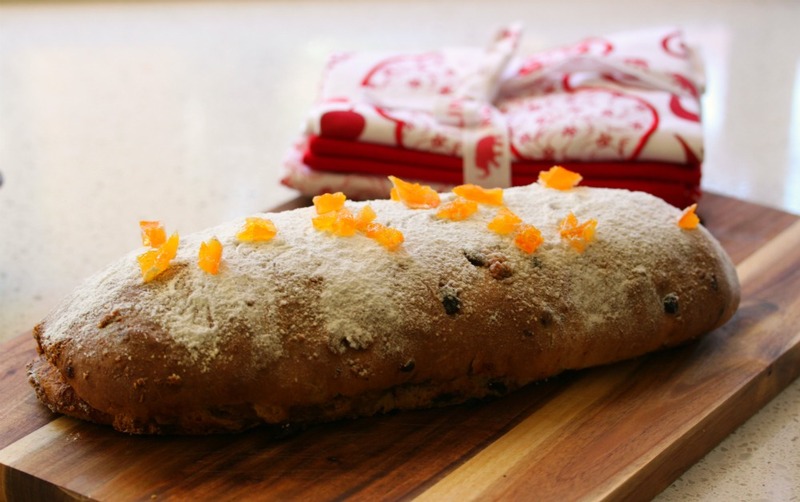 Stollen is buttery, almond and fruit laden with just a hint of in this case, pistachio marzipan…there I go again with that marzipan…its the new Umami…for Christmas this year. All the good recipe blogs are wearing it! Well its all about sugar plums…so this had to make the cut. For me the lead up to Christmas is about eating yummy light meals that will get me through in between the myriad of parties and eating festivities that dominate the calendar at this time of year, so Sugar Roasted Plum Salad is delish, light and a great mid week lunch or an accompaniment to something more substantial on the weekend. Make a date with these rolls and you won’t be disappointed in love!! I enjoy a little sweetness with savoury from time to time and for some reason at Christmas time, we do that a little more often. (Think glazed ham, cranberry sauce etc) So these Date rolls go extremely well with Christmas Dinner, or lunch, or just after with left over sliced ham, turkey or both. I make these every year, without a doubt. They make the cutest presents ever and of course I can but for a fleeting moment, imagine that I am in Italy…that far away place that I still have never been to…is there anyone out there willing to send me? I pledge to bring back more than just a big smile, recipes and knowledge to share. Siena Cake originates from, well, Siena and is sticky, fruity, and far nicer than anything you can buy. When it comes to gifting food, I am not short on ideas and I did a post last year about just this, so not strictly a recipe on its own, but a great post that just may get you thinking about how clever you could be with a little prod, some cellophane, curling ribbon and a Thermomix…Gourmet Gifts couldn’t be easier…go on, go see. 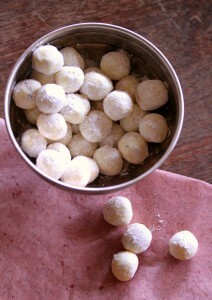 Whilst we’re on the whole giving gifts from the kitchen routine (and white chocolate as well), these Minty White Choc Truffles were an instant hit at our house and I must say, I have had a lot of great feedback about them as well. Easier than running to the shop and fighting the crowds…prettier and more personal. You can’t go past a great cookie recipe at Christmas and this is a bit of a grown up version of a Choc Chip cookie. 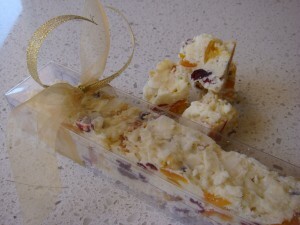 Developed way back in my original Kleenmaid days, these are even easier in the Thermomix. Time for a quick salad? 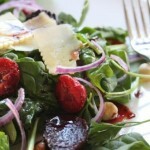 Red and Green Salad will always look festive and is so easy, I can barely call it a recipe…it is more of a suggestion. Enjoy on a hot day pre Christmas, throw a steak (or a prawn) on the barbie and you’re away! I don’t think Christmas can be complete without a little gingerbread…am I right? So even though these just went up on here, you must agree, they deserve a mention in the twelve recipes of 2011…I am hoping at some point to contruct a gingerbread house out of this cookie recipe, but with the big day fast approaching, I am not confident it will be this year it shows up! The flavored sugar recipe is delish as a Christmas tweak to anything requiring a little sugar, so think whipped cream, coffee, Crio Bru, your partner….you get the idea.